Discussion in 'Pain and Inflammation' started by OhShoot, Aug 7, 2018. I was introduced to a diagnosis today that I found a bit disturbing. It’s called Amplified Musculoskeletal Pain Syndrome, and the chatter around it reminds me of GET and the like—symptoms seem disproportionate, exercising through the pain won’t harm you, fear of movement, the pain is bad because you give in to it, central sensitization, etc. Basically they try to flood your brain so it desensitizes to the pain. My doctor found it inhumane. And while some of the concepts seem reasonable in theory, the approach sets off a lot of red flags. So I was wondering if any of you had heard of this before, knew how it was developed, or knew who it was associated with. Apologies if this is in the wrong forum. I just got home from an appointment, and the brain fog is bad with this one. Sly Saint, JaimeS, MEMarge and 3 others like this. Frightening how they dress up medical torture as treatment. Especially this: "Those children who are unable to work through their AMPS pain and restore function over time with an outpatient treatment plan may require a therapeutic hospital treatment program for AMPS." JaimeS, MEMarge, Inara and 2 others like this. YES. I believe I also read something about taking away pain medication being part of the “treatment”. JaimeS, MEMarge and Inara like this. This is awful! I haven't trusted the medical profession on the subject of pain for about 45 years, and it looks as though nothing ever changes in their attitudes. This sounds like institutionalised torture! JaimeS, MEMarge, Inara and 3 others like this. Ah, I’ve found something else, and it’s solidly linking this to the psychosomatic school. I swear I’ve read this article before, too. Have pain? Are you crazy? I’m going to compile some info to send to my doctor, because I think she’ll be very receptive. She’s just unaware of the politics surrounding things like this. Sly Saint, JaimeS, MEMarge and 5 others like this. That was an interesting article, thanks @OhShoot for linking. Reminds me of MUS, BDD, BDS and the like - they all sound so similar. What a confused mess. And now there's a deLIGHTful</sarcasm> article at NPR about it and its treatment: HyperMegaSuperGET (how do I put a trademark sign on that?). Because if a doctor says there's such a thing as Amplified Pain Syndrome (but no ability to actually objectively demonstrate such a thing exists) and that its treatment is causing more pain (I'm not joking; that is literally what they are saying), then surely it must be so. Trust me; I'm a doctor! What's sad is how much time and expense went into producing this PR puff piece masquerading as serious science journalism. The one thing I will say that I do agree with by implication is that the Visual Analog Scale (1-10 pain scale) is worthless for chronic pain. I'm far more interested in my ability to function than what number I happen to come up with in any given moment to convey the intensity of my pain. I'd even be willing to say that some CBT to help kids learn emotional regulation may be helpful in learning how to cope with pain (seriously, her mom's first thought was "is it cancer? "; can't tell if that is the journalist making her look histrionic or that she is, indeed, histrionic). BPS research has so infected the chronic pain field at this point that it's impossible to say anything with any certainty when it comes to treatment of chronic pain that is not well-characterized (and even the well-characterized stuff they're trying more and more to argue is better treated with yoga and mindfulness meditation). Which is not satisfying for anybody, except maybe the assholes creating more and more "validated" psychometric screening tools (the process for validating said tools I've always meant to ask @Woolie about because it looks pretty damn circular to me) and the Cognitive Behavioral Therapists reaping all the patients those tools funnel their way. shak8, Inara, ahimsa and 6 others like this. Is this a means of reducing complaints about pain? Fewer will go to their Drs looking for pain relief, if they fear an AMPS diagnosis and treatment like that! shak8, Inara, James Morris-Lent and 6 others like this. and it takes the Chronic widespread pain code rather than have a unique ICD code of its own, as it had had in ICD-10. Antonia Barke, one of the work group members for the IASP Task Force Classification of Chronic Pain (Chairmen: Rolf-Detlef Treede and Winfried Rief) that worked with the WHO on the development of these new Chronic primary pain categories  wanted BDD secondary parented to these Chronic primary pain categories (this has not been agreed by WHO). There is significant overlap between the conceptualization of ICD-11's BDD (and DSM-5's SSD) and the conceptualization of these new ICD-11 Chronic primary pain categories. 1 Treede*, R.-D., Rief*, W., Barke*, A., Aziz, Q., Bennett, M.I., Benoliel, R., Cohen, M., Evers, S., Finnerup, N.B., First, M.B., Giamberardino, M.A., Kaasa, S., Kosek, E., Lavand'homme, P., Nicholas, M., Perrot, S., Scholz, J., Schug, S., Smith, B.H., Svensson, P., Vlaeyen, J.W., Wang, S.-J. (2015). A classification of chronic pain for ICD-11, PAIN, June 2015 (in press). DOI: 10.1097/j.pain.0000000000000160. shak8, Inara, Sly Saint and 2 others like this. I know that we diagnose fibromyalgia via tender points, but any person with FM knows the experience of having FM goes far beyond pain. It's like moving ME or even Fukuda CFS to "fatigue, unspecified". Multiple accounts that they lied about their pain going away in order to escape continuing the therapy. shak8, Inara, ScottTriGuy and 2 others like this. Hmm... yes. If there's one thing victims of torture all agree on is that you get you used to it eventually and it's barely a bother after a while, you can even learn to enjoy it if you just pretend it's an aggressive massage. Famously, that's why nobody uses torture anymore, because you just get used to it thanks to this modern technological marvel of "mind over body". Torturers everywhere are out of job, it's brutal for unemployment. It's not quite pain but a lot of people have boasted that they could handle waterboarding like it's nothing. Most have the good sense not to prove themselves wrong. Those who did not have that good sense somehow disagreed with their former opinion and did a lot of crying and shouting in the process. And just imagine that if it hadn't been for a courageous researcher infecting himself to prove his theory, peptic ulcers would likely still be treated as psychosomatic to this day. It's not recommended but the guy had a solid theoretical model. Somehow I don't see any of those pain researchers giving it a try and having their own sobbing face tell them how full of crap they are. shak8, Inara, Pyrrhus and 4 others like this. you can even learn to enjoy it if you just pretend it's an aggressive massage. This is really funny, but I mean it may burn out the NS pathways that help process pain through overuse. That's the idea, anyway -- I haven't had the time to research how legitimate that may be. shak8 and ScottTriGuy like this. The ACR dropped the tender points in their revised 2010 criteria for fibromyalgia. shak8 and JaimeS like this. Fibromyalgia is characterised by chronic diffuse pain, intense fatigue and sleep disturbances often associated with anxiety or depression, and triggered by physical or psychological trauma. It was recognised as a rheumatic disease by the WHO in 1992. Diagnosis criteria include a three month history of diffuse pain without a disorder that would otherwise explain the pain. Available evidence implicates the central nervous system as key to maintaining the pain and other core symptoms of FM and related conditions. FM is associated with substantial negative consequences for physical and social functioning. Chronic widespread pain (CWP) is diffuse pain in at least 4 of 5 body regions and is associated with significant emotional distress (anxiety, anger/frustration or depressed mood) or functional disability (interference in daily life activities and reduced participation in social roles) . CWP is multifactorial: biological, psychological and social factors contribute to the pain syndrome. The diagnosis is appropriate when the pain is not directly attributable to a nociceptive process in these regions and there are features consistent with nociplastic pain  and identified psychological and social contributors. Chronic widespread pain (CWP) is diffuse pain in at least 4 of 5 body regions and is associated with significant emotional distress (anxiety, anger/frustration or depressed mood) and functional disability (interference in daily life activities and reduced participation in social roles) . CWP is multifactorial: biological, psychological and social factors contribute to the pain syndrome. The diagnosis is appropriate when the pain is not directly attributable to a nociceptive process in those regions and there are features consistent with nociplastic pain  and identified psychological and social contributors. Other chronic pain diagnoses to be considered are chronic cancer pain, chronic postsurgical or posttraumatic pain, chronic neuropathic pain, chronic visceral pain and chronic musculoskeletal pain. Chronic widespread pain (CWP) is usually present in at least 3 or more body quadrants (quadrants are defined by upper-lower/left-right side of the body) and axial skeleton (neck, back, chest and abdomen) . CWP is often associated with increased medical comorbidity, including sleep disturbances, obesity, hypertension, and diabetes . Patients with CWP often report increased disability, depressed and anxious mood [3-8]. Patients present with spontaneous or evoked pain in the affected regions, accompanied by allodynia and/or hyperalgesia. Anxiety, depression, and distress generally, may amplify pain in patients with CWP . A. Chronic pain (persistent or recurrent for longer than 3 months) is present in at least three body quadrants plus the axial skeleton (4 of 5 regions). B.1 Emotional distress due to pain is present. B.2 The pain interferes with daily life activities and social participation. C. The pain is not better accounted for by another chronic pain condition. The presence of pain, emotional distress and interference in daily activities due to pain should be established based on a thorough assessment procedure using standardized measures. Chronic primary pain is pain in 1 or more anatomic regions that persists or recurs for longer than 3 months and is associated with significant emotional distress or significant functional disability (interference with activities of daily life and participation in social roles) and that cannot be better explained by another chronic pain condition. *their proposal to relocate IBS was rejected by WHO in 2017. As we know, Rief and Per Fink did not achieve a new chapter or section within the core ICD-11 in which to corral the so-called functional somatic syndromes or Fink's BDS construct. 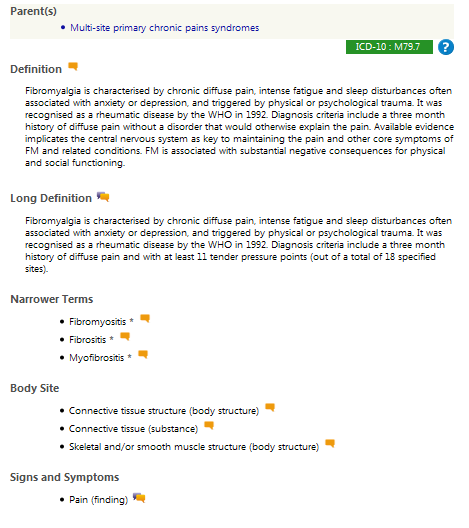 But Rief and colleagues did get these new Chronic primary pain categories added to ICD-11 in the Symptoms, signs chapter (which overlap conceptually with ICD-10's F45.4 Persistent somatoform pain disorder: https://icd.who.int/browse10/2016/en#/F45.4 ). Fibromyalgia is characterised by chronic diffuse pain, intense fatigue and sleep disturbances often associated with anxiety or depression, and triggered by physical or psychological trauma. That's... a really awful description. I had no idea people were trying to say everyone with FM had to be depressed, anxious, or angry. It certainly seems to me that these are natural reactions to a) being in constant pain and b) being constantly dismissed/belittled for it. Back again to this idea that well people have no idea what emotionally healthy reactions are to being chronically ill.
shak8, DigitalDrifter, Hutan and 7 others like this. Although I've monitored and reported on the change of parent and chapter location for Fibromyalgia since the change was entered into the Beta draft in 2015 as part of my general monitoring of proposed changes for ICD-11, Fibromyalgia isn't within my scope of advocacy interest. I have read some of Frederick Wolfe et al's papers on FM criteria and also his paper on DSM-5 and the percentage of FM patients the authors consider may be captured by SSD . But I don't know whether the 2010 FM criteria have been internationally accepted. Some of the categories listed under the new Chronic pain section were originally proposed to be secondary parented to other chapters. But when Fibromyalgia was relocated to the Symptoms, signs chapter, there was no proposed secondary parenting to its original chapter location: Diseases of the musculoskeletal system and connective tissue chapter. The Description text for Fibromyalgia does not appear to have been revised from how the text had stood prior to its chapter relocation in May 2015. When ICD-11 was in the initial "Start-up phase", followed by the Alpha drafting phase, the text fields for tentative draft Description texts (then known as "Definitions") and other content parameters had been populated by WHO/ICD-11 development and working groups from a variety of sources - from content in other classification systems and from the websites of leading health agencies etc. I traced the source for the text for FM as it stood in 2015 and the most likely source was text that had stood on an Orphanet page, which had apparently last been updated in May 2007, but which appended links to more recent criteria and practice guidelines (these FM description texts appear to have been removed from the Orphanet site since I noted these, in 2015). Orphanet were charged by ICD Revision to provide content for rare diseases for the ICD-11 "Start-up", Alpha and Beta drafting phases, but also provided initial content for some disorders/diseases that aren't considered rare. For many of the 55,000 categories in ICD-11, their Description content text will have gone through several iterations, during the 11 year long development process, with ICD Revision working groups, professional bodies and clinician and lay stakeholders submitting suggestions for edits, which if approved will have been incorporated into the draft. It's unclear whether the ICD-11 Musculoskeletal Topic Advisory Group retained any oversight for the classification of FM once the decision to relocate FM to the new Chronic pain section had been approved by ICD Revision, or whether responsibility for FM now lay solely with the IASP Task Force. So the opinions of the Musculoskeletal Topic Advisory Group on FM's relocation aren't known. But FM's revised classification for ICD-11 does appear to have been neglected by stakeholders. But no new proposals or suggestions for revised content or comments on the existing Description text and content have been submitted in the name of any FM advocacy org, or professional body. And whilst I have assisted several other non ME patient groups and clinician stakeholders to navigate the Proposal Mechanism and advised on formatting proposals and the requirement for including rationales and citing an evidence base in support of proposals, FM is not my area of interest and I have no mandate to submit proposals or suggestions for changes to the existing content. Additionally, just as there is political division amongst ME patients and advocates over whether Chronic fatigue syndrome should remain under the R codes for ICD-10-CM or be restored under the G93.3 parent, in line with the WHO's ICD-10, there is political division amongst FM stakeholders and advocacy groups over how FM should be defined and whether the name for FM should be deprecated and replaced with "Chronic widespread pain." Some patients who have welcomed the change may not have not familiarised themselves with the conceptualisation of ICD-11's new Chronic pain and Chronic primary pain categories. Inara, JaimeS and ScottTriGuy like this. JaimeS, Trish and ScottTriGuy like this. Ugh. That one is also quite involved. A pal of Henningsen's. I wish people would stop with that. Childhood trauma leads to increases in all cause mortality. You are more likely to be sick in general. Funny re: how the studies on childhood trauma typically focus on chronic diseases that affect mostly women. Perhaps more females than males are traumatised in childhood. My upbringing was very sexist, and my brother was the favoured child in virtually everything. Inara and JaimeS like this.